Comment Varied countryside with a modest climb to some pleasant views. Inevitably there are stiles. With ‘King & Queen’ pub on your right, walk up the side road with a brick pavement to the lychgate into Edenbridge Parish Church graveyard. Go through the lychgate and turn left up the churchyard passing the church on your right. Continue along the top edge of the churchyard by a brick wall. Just before an iron kissing gate at the far corner, turn right on an asphalt path going down the churchyard towards houses. Leave the churchyard through a gateway onto a road. Bear right across the road to a footpath between houses. Soon cross a footbridge into a meadow. Bear slightly left across to the far left corner (ignore a cross path and footbridge over on the left). Leave the meadow and walk along with a river on your left. Soon reach a stile and footbridge in a hedge (ignore footpath off on right). Over the footbridge go forward slightly uphill (ignore a cross path). At the top of the hill, exit through a kissing gate onto a road. Turn sharp left onto a gravel farm track. Pass the farm buildings and stables on your left and enter a field. Go forward bearing slightly left to a brick railway bridge. Cross this into an enclosed path. At the end emerge into a field. Continue along field edge with a ditch and hedge on your right. Pass into a second field and keep on in the same direction towards farm buildings. On nearing the farm, cross a stile in the hedge on the right, into a meadow. Bear diagonally left across the meadow, passing the farm over on your left, to a stile in the far corner. Cross onto an entrance drive and turn left down to a T-junction. Turn left for a short distance to reach a pond. Here bear right onto a gravel farm track. Go between gardens and trees to cross a river. Go on through a metal kissing gate and uphill on the track. Where the track ends reach a fork of footpaths. Take the righthand path going directly uphill. In the top corner ignore a stile on your right and go forward through a kissing gate into the pasture ahead. Keep forward along the edge with a hedge and treeline on your right. At the last tall tree the hedge swings right. Keep straight on across the open field to two trees at the far side. Here there is a stile. Cross into a corner by a reservoir. Turn left on a rough track with trees and a hedge on your left. On nearing a house ahead, bear left into the hedge to a poor stile and go on up an enclosed path. Pass the house on your right and continue up a vehicle track to a T-junction. Turn right here by Medhurst Row. Soon reach a broken fieldgate at a gateway. Turn left off the track into a field and immediately right along the edge with a hedge on your right and railway over on left. The hedge soon ends. Go forward, bearing slightly left down to a concrete bridge in the bottom left corner (path currently not reinstated through crops). Cross the bridge and go up to a gravel track. Follow this to a railway underbridge. Do not go through the bridge but bear right over to a stile onto an enclosed path following the railway on your left. Eventually the path turns right and after currently negotiating a fallen tree emerges over a poor stile onto a road. Turn left up the road. Pass a house on the right then look for a large gap into the field on the right (no fingerpost here). Go through the gap into the field. In the fence at the far side are two stiles. Cross to the righthand stile. Enter the field ahead and swing gently right downhill to trees at the far side. Cross a footbridge into woods. Exit through a metal kissing gate and keep on up a rising pasture bearing slightly left. At the top of the slope find a stile in the hedge. Cross to a road and turn left. Continue past a side road on the left to reach a T-junction. Turn right a short distance to reach a footpath on your left. Cross a stile into an enclosed path. At the end, cross into a golf course. Go ahead on a gravel track with a hedge on your left for ½ mile. At the end bear left through trees to a brick bridge by a pond. Cross and go forward uphill along the edge of the golf course close to a hedge on your right. Just over the top of the hill, by a green down on your left, look for a stile in the hedge on the right. Cross and go along a field edge with a hedge on your right, towards cottages. Leave the field over a stile by a metal fieldgate onto a rough track by cottages at Gravelpits. 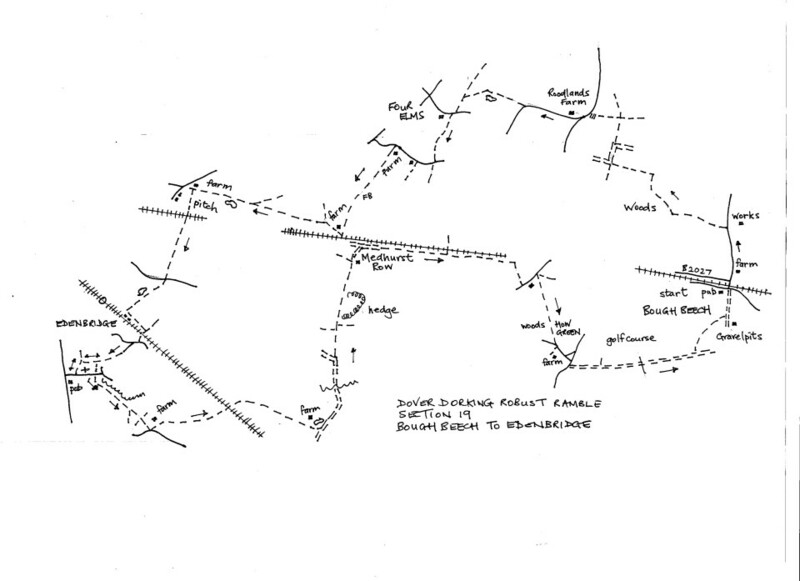 Turn left on the track and follow it down to a junction of roads by ‘The Wheatsheaf’ pub at the start of the section.